It may be hard to fathom that the original Martin pergola, conservatory and carriage house were razed by bulldozers in 1962. But this small, sculptural fragment from a conservatory art glass window is a surreal reminder and proof positive that three of five original buildings of Frank Lloyd Wright's Martin House complex were torn down, art glass and all. The fragment is a "blossom" section from one of the conservatory windows or door panels (left) - small squares and chevrons of glass and caming that suggest a flower head. These were balanced atop a vertical "stem," accented with triangular, abstract "leaves." It's a curious piece of modern spolia (literally, "spoils"), a term used to describe the Romans' extensive recycling of architectural elements. The Romans incorporated fragments of previous buildings from throughout the empire (including Egyptian obelisks, Greek columns and sculpture, etc.) into new structures. In this case, the recycling process is not complete, but there isn't a similarly evocative term for rescued architectural fragments that become museum collection items (at best) or conversation pieces (at least). Martin House Senior Curator Jack Quinan recovered this art glass fragment from the back-fill of the original conservatory site in 2004, prior to the reconstruction of the building. He soon came to refer to that heap of dirt as the "spoils" pile, as it yielded several boxes full of original floor tile, various types of glass, brass caming, fragments of Novus glass and the like. No pieces of the True Cross, but some "holy relics" of original Wright buildings nonetheless. For more of the strange and gruesome tale of the demolished Martin art glass windows, see "Stranger Than Fiction" and "Picking Up the Pieces," previous posts on the Weekly Wright-up. 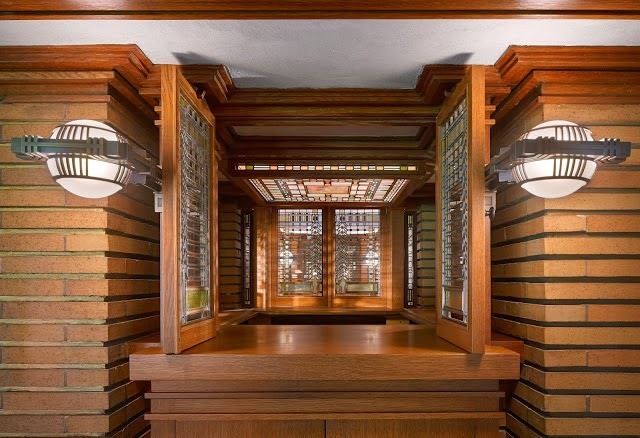 Amazing to think that anyone would destroy something as beautiful, with so much character and charm as a Frank Lloyd Wright creation. Thank God for the wonderful people working so hard to restore this wonderful place.